Easter is a couple of weeks away now and Wandgas Football Club (Cromwell Road, KT4 7JW) have contacted the blog to let me know about their Great Wandgas Easter Egg Hunt on Easter Monday (28th March). It all 'kicks off' at 10:30am. Non-members are very welcome. 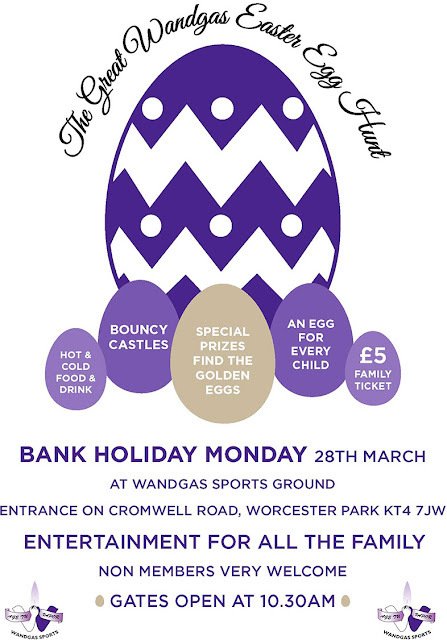 It costs just £5 for a family ticket and every child is guaranteed an Egg! Wandgas Footbal Club are an FA Community Standard Club and teams play in the a variety of leagues ranging from the Surrey Youth League to the Kingston & District League Premier Division for their Saturday 1st team. The club currently boasts 13 Youth Sides, 3 Football for All Sides, 3 Senior Sides and 3 Vets sides. They also offer a "lively and enjoyable social club" as well as cricket teams and coaching throughout the summer months.